Flavia de Luce has been described as a pint-sized genius detective with a penchant for poison and trouble. She resides in Bishop's Lacey, England with her father and two older sisters. It is the early 1950s and England is still recovering from World War II. Their mother, Harriet de Luce, has been missing and presumed dead for ten years, so Flavia has no memory of her whatsoever. Their father, Colonel Haviland de Luce, is an absent-minded parent and totally engrossed with philately (stamp collecting). Ophelia (Feely), the eldest sister, is an accomplished musician and soon to be engaged. Daphne (Daffy), the middle sister, is a devoted reader. Flavia is often left alone and has become enamored with chemistry and investigating crime, specifically murder. 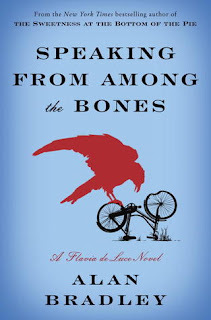 Speaking From Among the Bones begins with Flavia sitting with Feely in St. Tancred's Church while Feely practices the organ. As Flavia awaits her sister, she wonders if she'll ever get to investigate a fifth murder. Ask and ye shall receive . . . Shortly after the evening's rehearsal during the exhumation of St. Tancred on his quincentennial, Flavia volunteers to peer into the crypt and discovers the body of the former church organist, Crispin Collicutt. The discovery of the body in the crypt – the wrong body in the crypt, the mystery of who put it there and why, the upcoming engagement of Feely to Dieter, the appearance of a man of mystery - Adam T. Sowerby (a floral archeologist and detective), and the idea that Buckshaw is about to be sold all add up to another wonderful Flavia adventure. Speaking From Among the Bones reveals a maturing Flavia and for the first time she actually empathizes with her father and sisters. She has also learned to control herself and isn't as prone to outbursts as we've seen in the past. Although Flavia is maturing, she is still a child in many ways and provides some decidedly non-adult thinking for a few of her adventures, such as exploring a tunnel found in the cemetery and frightening the vicar's wife, as well as her 'relationship' with her trusty steed Gladys, a bicycle. Yet her maturity shines through with her empathy toward her sisters, the burgeoning working relationship with Adam Sowerby and continuing relationship with Inspector Hewitt. Mr. Bradley has provided another raucous and delightful Flavia mystery thriller. I must warn you that the ending is somewhat of a shock (to find out what it is you'll simply have to read the book). I can't wait to read the next Flavia installment to see what will happen. If you haven't read any books in the Flavia series, then I strongly recommend you start. Previous books in this series (in order of publication) are: The Sweetness at the Bottom of the Pie, The Weed that Strings the Hangman's Bag, A Red Herring Without Mustard, and I Am Half-Sick of Shadows. Next up in this series is The Dead in Their Vaulted Arches and is scheduled for release in early 2014. To learn more about this series, please visit: www.flaviadeluce.com.